Destiny is defines as a predetermined course of events which in turn predetermines each ones future or the general future. Destiny may be envisaged as fore-ordained by the Divine or unfolding through the exertions of human will. 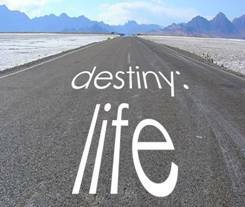 Destiny can be otherwise used as a synonym for the words karma and fate. It is the guiding force which makes each one to travel through our life and to reach what we destined for either good or bad. It heavily influences the events in our lives, the decisions we make, who we spend our lives with. It takes control over each ones life thereby that of the entire society and of a nation. Thus when a man of bad destinies rule a country or a society he invariably also let his society or his country to face more difficulties. Thus the only way by which a man can bring changes to his destiny is by spiritual practice and depending upon each ones severity of destiny the level of spiritual practice they have to follow also varies. As destiny determines the major events in each ones life like birth, marriage, major illnesses, accidents and death and if he or she is predetermined for a bad destiny then the only way they can overcome or nullify the effects is only by spiritual guidance. Thus it is concept based on the natural order to the universe which is fixed. Any event happening in the universe or to an individual either a major or insignificant does not happens as a matter of coincidence but it is only destiny which has created a unit to take place in each and every ones life. This includes even the minute things we see and a small noise we hear. Destiny is not a superstition but has a strong psychological basis. Thus every small thing like a flower blooming and fading, a man coming to existence and death is all destined to happen which can never be judged by testing or weighing its degree. At times destiny acts as a psychological medicine, in places where things go severely wrong even after hard work but in such times where destiny comes to action with its predetermined medicine. It also acts as a means of satisfaction of our both positive and negative feelings where the latter usually arises from factors like jealous, anger, revenge etc.Most of the times destiny and hard work are considered to be the two different sides of the same coin for our destiny determines the level of our hard work. For hard working people success is always at the door steps whose stars are considered to be bright whereas for some people with a minus of hardwork the stars are supposed to be dim which can be brightened only by means of hardwork. The views about life vary from west to east. The western view is that we can control or change our destiny in our life, ultimately saying that whatever happening or to happen in our life is our own choice. The eastern point of view depicts that nothing happening in each ones life is under our control but it all happens as a preordained plan and we just play the role of actors. But however both are not really correct. From the science of spirituality point of view destiny rules 65% of our lives and the rest 35% by our willful action. Since destiny is based on the action and deeds we do, 65% of it can be corrected or overcome by the 35% of our willful action which is mainly by indulging ourselves in spiritual practice. Thus people who depend on destiny have no control over their life situations and thinks that everything happening has as a fixed sequence of events that cannot be changed whereas people who depend on willful action have control over each and everything they do and they choose different path to reach their destiny. There are only two ways to conquer destiny or be independent of it. One is to enquire for whom is this destiny and discover that only the ego is bound by destiny and not the Self, and that the ego is non-existent. The other way is to kill the ego by completely surrendering to the Lord, by realizing one's helplessness and saying all the time, Surrender can never be regarded as complete so long as the devotee wants this or that from the Lord. Destiny can be attained in two ways. The first way is to study the different destinies available for you and if you are not destined for it put aside yourself and either makes your ego non exsistent or bound it by destiny. The second way is to just realize your helpless situation and surrender flat to the lord asking for your need thus putting your ego apart and killing it. True surrender is love of God for the sake of love and nothing else, not even for the sake of liberation. The conquest of destiny can be successful only if you efface the ego by devotion in the spiritual path. As the saying goes �As you sow so you reap� similarly the fruit of good deeds is happiness and so is the fruit of bad deeds is pain. A man of good acts acquires merits with good fortunes, while an idler falls away from his estate, and reaps evil like the infusion of alkaline matter into a wound. Thus friends, prosperity and all good things descends from generation to generation not only by destiny but also by exertion of oneself and so is life after death also is decided either in the heaven or the hell.